Let’s take a look at five of the best! Warabi-mochi is a squishy Japanese sweet that’s coated in soybean flour. Despite the name, it’s not actually mochi, being made from bracken starch rather than glutinous rice. 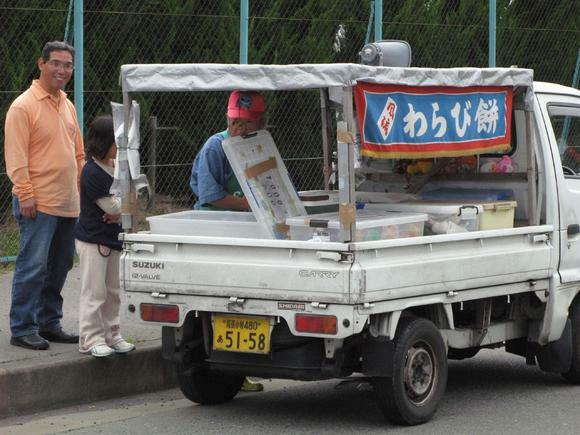 ▼ The gentleman on the left is pulling his best “the warabi-mochi truck is here!” face. When autumn rolls in, though, the warabi-mochi song is replaced by one that advertises a piping hot treat: baked sweet potato. “Ishi yaki-mo, yaki-imo, yaki-imoooooooooo” [stone-baked potato] goes the song, which is also sung by a groovy old guy (the same man, perhaps?!) When baked, the red skin of Japanese sweet potato turns a darker purple, and the white flesh goes golden. ▼ That’s right. Japanese potatoes are made of gold. ▼ Question is, how do you fill it up with fuel? Bet they don’t let you in the gas station when your truck has a fired oven on the back. Writer and all-round Japan buff Gakuranman has this lovely video on his YouTube channel of his interaction with a sweet-potato seller. You can hear the yaki-imo song in his video, too! The tofu truck (or bicycle trailer!) is recognisable by its distinctive trumpet tune. That, and the fact it’s a truck that only sells tofu. Well, ok. It actually sells other products made from soy beans, too. But that’s still pretty specialised! BONUS: In times of financial difficulty, what do you do when your family business’s premises look to become untenable? Get rid of the ramen shop and open up a ramen truck instead! Sadly, there’s no “ramen song” yet, but there probably should be. ▼ Ramen: tastes way better eaten outside anyway. 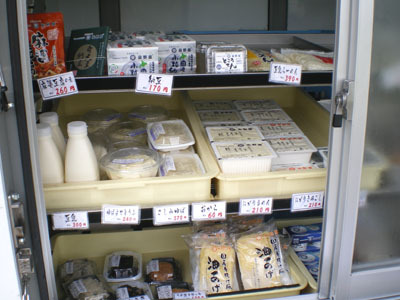 Delicious sweets and fresh tofu brought to your door are one thing, but what about household items? A pole to hang your laundry outside is a household essential, but if you go to a shop to buy it, getting it home could be tricky. It won’t fit in the car, and you can’t walk it home, unless you want to carry it with a friend like some kind of terrible comedy act. Fear not, dear reader! In Japan, there’s a specialised door-to-door truck for that! These ones are called saodake-ya, meaning “bamboo pole shop”, because (you guessed it) back in the day, the poles all used to be bamboo. And these trucks also have their own song, this one by a lovely lady singing “Take-yaaaaaaa, saodakeeeeeee!”, which means“bamboo seller, bamboo poles”. ▼ Here’s a video of a dog singing along with her. Central heating not being the norm in Japanese homes, kerosene space heaters are a popular option. Accordingly, these trucks go door-to-door selling kerosene! This not only saves Japan’s ageing population from having to work out how to get a heavy bottle of kerosene home, but also provides us with another jingle, this time a children’s song. ▼ If you like your nostalgic kids’ songs set to a backing video of someone tailing a truck, this is the vid for you. See? When the shops come to you, you never have to go to the shops again! So long as you don’t mind only eating tofu, sweet potatoes and mochi, that is.